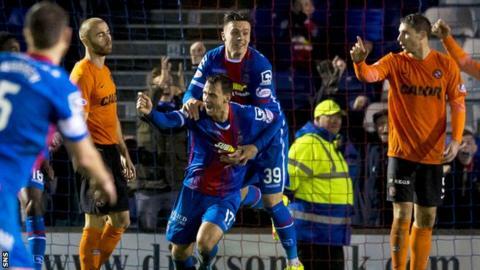 Dundee United were denied a much needed win by a late equaliser from Inverness CT's Lewis Horner. John Rankin gave the visitors the lead with a left-foot shot into the roof of the net. Liam Polworth side footed a cross into net seconds after half-time to level. Billy McKay thought he'd won it when he stabbed United in front, only for Horner to bundle the ball over the line at the death. It was a cruel blow for the Premiership's bottom side just when they thought they had claimed a third win of the season. There was certainly no sign of a crisis of confidence about Mixu Paatelainen team's play going forward as McKay nearly scored after just 20 seconds. Chris Erskine skinned Horner down the left and McKay was just inches away from knocking home the cross. That was the start of a traumatic first half for Horner - who was to have the last laugh - as all of the visitors effective attacks started in his area of the park. That included the route from which they carved out the opening goal with the only surprise being it wasn't McKay who claimed it. It was another former Caley Thistle player, though, as Rankin marked his recall to the starting line with a vicious 16-yard drive from Scott Fraser's cut back. That was the first any Dundee United player other than McKay had scored in the Premiership since Sean Dillon netted against Ross County in September. While they might have struggled to score goals, the club at the foot of the league have had no such problem conceding them this season. Quite why that should be the case was evident from the panicky way they went about coping with whatever Inverness could throw at them. They did have a big slice of luck just before the interval when James Vincent squandered the Highlanders' best chance of the first half. Polworth placed the perfect cross on his team-mate's head just six yards out, but with the goal gaping the midfielder steered it wide. Polworth decided to take more direct action as Caley levelled within seconds of the restart as he guided in a Danny Williams cross. However his desire to add a second was probably the wrong option as his shot from an acute angle was saved when there were team-mates screaming for a pass. It was a fumble by Wales international Owain Fon Williams that helped United score a second goal in a league game for the first time since August. He spilled a cross from the left and McKay pounced to clip in the loose ball for his eighth league goal of the season. However, there was cruel twist of fate two minutes into stoppage time as Inverness pressure paid off when Horner's header just crossed the line before being cleared to earn his side a point. Match ends, Inverness CT 2, Dundee United 2. Second Half ends, Inverness CT 2, Dundee United 2. Corner, Inverness CT. Conceded by Paul Dixon. Callum Morris (Dundee United) wins a free kick on the right wing. Goal! Inverness CT 2, Dundee United 2. Lewis Horner (Inverness CT) header from very close range to the bottom right corner. Assisted by Carl Tremarco. Substitution, Inverness CT. Tobi Sho-Silva replaces James Vincent. Substitution, Dundee United. Sean Dillon replaces Billy McKay. Gary Warren (Inverness CT) hits the bar with a header from the centre of the box. Corner, Inverness CT. Conceded by John Rankin. Substitution, Inverness CT. Carl Tremarco replaces Nathaniel Wedderburn. Nathaniel Wedderburn (Inverness CT) wins a free kick in the attacking half. Attempt missed. Gavin Gunning (Dundee United) right footed shot from outside the box is just a bit too high from a direct free kick. Goal! Inverness CT 1, Dundee United 2. Billy McKay (Dundee United) right footed shot from the centre of the box to the bottom left corner. Assisted by Chris Erskine. Attempt saved. John Rankin (Dundee United) right footed shot from outside the box is saved in the bottom left corner. Substitution, Dundee United. John Souttar replaces Guy Demel. Paul Dixon (Dundee United) is shown the yellow card for a bad foul. Andrea Mbuyi-Mutombo (Inverness CT) wins a free kick in the defensive half. Guy Demel (Dundee United) wins a free kick on the left wing. Attempt missed. Gary Warren (Inverness CT) header from the centre of the box is close, but misses to the right. Corner, Inverness CT. Conceded by Callum Morris. Substitution, Inverness CT. Andrea Mbuyi-Mutombo replaces Iain Vigurs. Corner, Dundee United. Conceded by Danny Williams. Attempt saved. Scott Fraser (Dundee United) right footed shot from the centre of the box is saved in the top centre of the goal. Billy McKay (Dundee United) wins a free kick on the left wing.